Get the breakfast. Tidy the house, buy food, dress the kids, tidy the house, wipe the kids, cook food, undress the kids, serve food, bath the kids, tidy the house. AGAIN. It’s tedious. It’s boring. It’s frustrating. It’s endless. 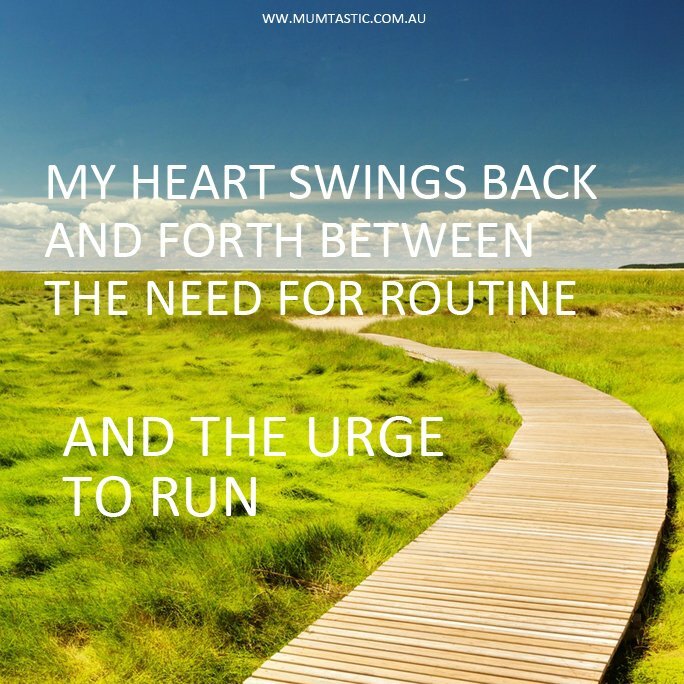 “My heart swings back and forth between the need for routine and the urge to run” – Unknown. Does that speak to you too? Psychologically, routine is important. A routine is formed by a series of habits that free us from the need for constant decisions. You don’t need to think about grabbing your phone, keys and bag, getting into the car and putting your seat belt on. Imagine how exhausting your day would be if you did? It’s habit that creates a routine. You do it, no thought required. Add those routines together and you’ve got structure to your day. Kids thrive on routine. 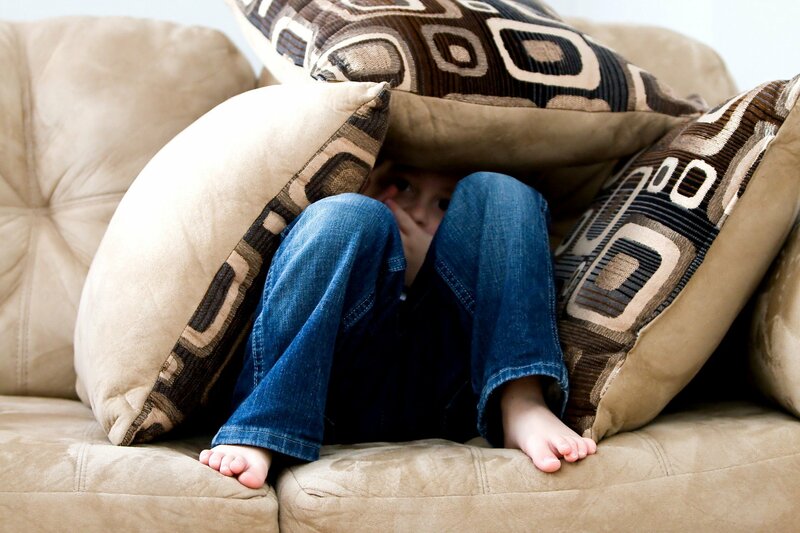 An organised and predictable home environment helps children and teens feel safe and secure in a world that can be confusing at times. The downside of routine is it can feel confining, like we need something ‘more’ or ‘different’. We need to break out of the routine to experience our days as more interesting, more challenging or more exciting. 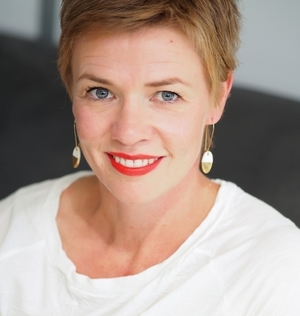 While struggling with the routine and monotony of parenting recently, I was reminded of a story from prominent psychologist Dr Martin Seligman, in his book ‘Authentic Happiness‘. While Seligman was visiting a friend in a coma the janitor of the hospital was busying himself positioning artwork on the walls of the hospital room. He explained that he changed the art regularly, swapping each piece for something new and different. Dr Seligman asked him why he bothered changing the art in the room of an unconscious person. He couldn’t see it. What was the point? The janitor responded that all patients do better when they have new stimuli around them and that it was his job to make sure that they have new and beautiful art in their rooms. Dr Seligman was impressed that this gentleman thought of his job not as a series of menial cleaning tasks, but as an opportunity to nurture the wellbeing of others. This story reminds me that we have a choice in how we think about the monotonous elements of parenting. It reminds me that just by tweaking my thinking I can improve my attitude and make the daily jobs less irritating and more satisfying – sometimes at least. Psychologists call this positive reframing; choosing to think about challenges in a more positive, more helpful light. Now, instead of resenting the morning routine, I’m focusing on how helping the kids to eat a good breakfast gives them the energy they need to get through the day. Instead of getting cranky at Mr 3 for his inability to get himself dressed, I’m reminding myself that I’m teaching him skills he needs to be independent and self-sufficient. Instead of dragging my heels because I hate the morning drudge and then shouting and hustling the kids into the car, I’m getting us out of the door in time to walk to school in the sunshine, chatting and spending time together. Rather than despairing at the cooking and meal preparation, I’m setting myself a challenge to cook meals and make snacks that use what we have in the house, so that we don’t create waste. That feels good. Instead of lamenting the constant cleaning and tidying, I’m doing it quickly and efficiently so that I can sit and write or go outside to the garden knowing that the inside chaos is contained, at least for a little while. It doesn’t always work and if I’m sleep deprived it’s hard for the positive thoughts to rise to the surface. When I do manage it though, I turn frustration with the mundane into moments of happiness, gratitude and satisfaction. That has to be better than Groundhog Day. How do you deal with the tedium of the daily routine? Are you someone who thrives on it? Or do you have to positively reframe it too?